This is not your grandma’s hymn-version of this song! The music was that good. It deserved to be heard. And it became part of our family’s soundtrack, from the “Oh, Happy Day,” tune for which it had been purchased (later covered in the film “Sister Act,” fun for a whole new generation) to the crazy-great “Come and Go with Me to My Father’s House,” that one especially, my sister, Tami, and I still enjoy and break out singing to this day. But there was this other song, though I loved them all, that I found to be powerful, direct and just passionately spoke to my heart. 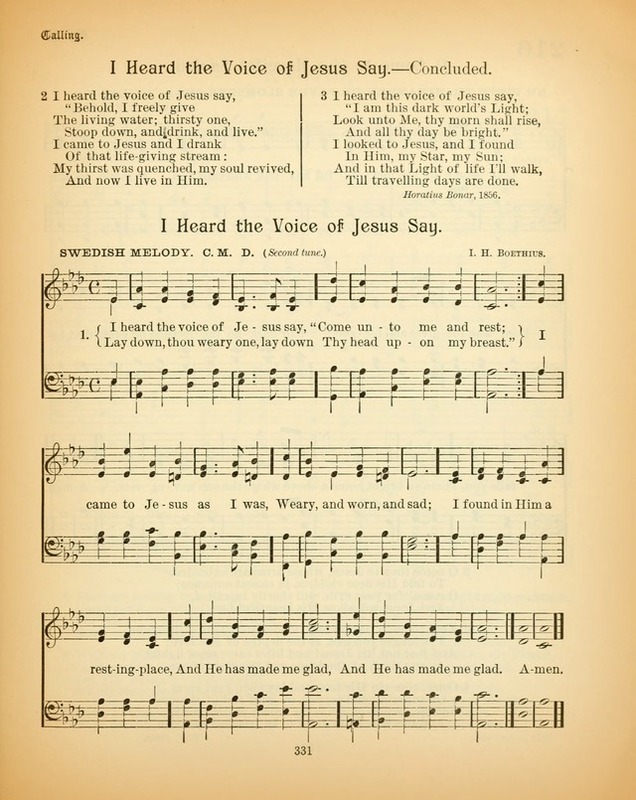 I was 10 when I loved it first and was surprised, as a young teen, to come across the original hymn, (Horatius Bonar wrote the words in 1846, with John Dykes adding music in 1868), in our church songbook. We didn’t sing it at our church at all. But I saw the lyrics were exacly the same as this Edwin Hawkins Singers song I loved, just not the melody. I didn’t even know what a cover song was then, but I had found one! Music and lyrics for the traditional version, straight out of a hymnbook! I heard the voice of Jesus say, “Come unto Me and rest; Lay down, thou weary one, lay down Thy head upon My breast.” I came to Jesus as I was, weary and worn and sad; I found in Him a resting place, and He has made me glad. Take my yoke upon you, and learn of me For my yoke is easy and my burden is light And my burden is light- I heard the voice of Jesus say, “Behold, I freely give The living water; thirsty one, stoop down, and drink, and live.” I came to Jesus, and I drank of that life giving stream; My thirst was quenched, my soul revived, and now I live in Him. I heard the voice of Jesus say, “I am this dark world’s Light; Look unto Me, thy morn shall rise, and all thy day be bright.” I looked to Jesus, and I found in Him my Star, my Sun; And in that light of life I’ll walk, till traveling days are done. Come unto to Me and rest. I love this song too! Though you just introduced it to me these past couple of years…. What great memories of God’s compassion, presence and power this song holds for me! This song has kept me from carrying burdens I needed not to carry. Christ is always present to actually help all who turn and take this timeless promise. Ride on King Jesus! So glad to find some one else who loves this song as much as I do! I love this song. It’s amazing! Though it was written nd sung so many years ago yet, when I listen to it, it blesses my heart! God bless! Hey, Gianni, I have no idea on that, but maybe some one stopping by will? Sorry for my English. Of course I hope answer me the author.